Full Disclosure: Estron provided the Linum BaX 2PIN cable with 2.5mm balanced termination for this review. 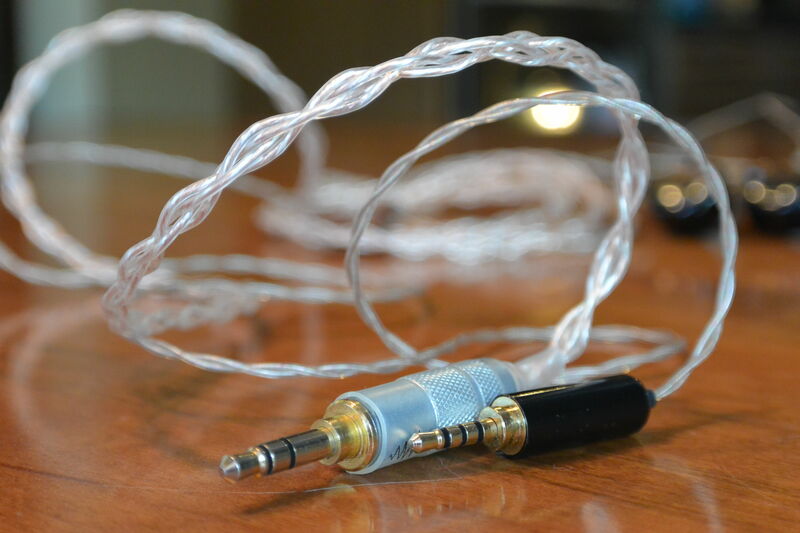 By now many have heard of the Linum line of IEM cables from Danish manufacturer Estron. In case you haven’t, think thin, very, very thin — then think thinner. The Linum line of cables is the thinnest I have ever seen, frankly thinner than I could have imagined, making all other cables seem fat and unwieldy in comparison. Linum cables are only 0.9 mm in diameter, resembling something you’d more likely find in a bait and tackle shop! On top of being thin, Linum cables are very soft and very flexible, weighing around 2.7 grams (0.095 oz). Not only are they practically invisible to the eye but they are virtually invisible to the touch when lying against your skin. When you are wearing an IEM with a Linum cable, it’s like wearing no cable at all. Seriously. The cable connected to the Ultimate Ears Reference Monitor. But a cable this thin has to give up something in the strength and durability departments, right? Not according to Estron. They believe they’ve struck a practical balance between small size, low mass and high tensile strength. Estron states a pull strength of 60 Newtons or 13 lbs. The cable jacket is made from a clear TPA and shouldn’t yellow over time thanks to high UV resistance. From my brief readings about TPA on the web, it seems to offer excellent combinations of strength, softness, elasticity and flexibility. Thus, the argument goes that the Linum line of cables was made to endure the rigors of musical stage performance. 2PIN is your standard UE and JHA two pin connection, while MMCX is the newer standard Westone and Shure (along with a few other companies) have moved to. The T2 is the new connector type developed by Estron, made especially for multiple insertions and removals. Estron claims it is strong enough to withstand 1,000 insertions and removals. The cable I’ll be reviewing here uses the 2PIN connection, but I do have a Cosmic Ears CE6P on order with the T2 connection (Cosmic Ears is the first custom in-ear monitor manufacturer to adopt the T2 connection for use in its products). The 2PIN connector overmolds are tiny, yet well-made and seemingly very durable. They will not protrude or cause awkward loops over the ear. In fact, like the wire itself, the small 2PIN connectors seem to disappear in use. A simple red or blue dot on the overmold denotes right or left sides. As so, Linum 2PIN overmolded connectors and wire should be ideal for users wearing glasses. The downside to their small size is that larger fingers may have to have a bit of patience when removing a Linum cable from their IEMs that have recessed sockets. Even though the latest UE CIEMs use an extruded two-pin socket, the small size of the Linum overmoded 2PIN connector looks like it was perfectly made for the the UE extruded socket. The Y-split and neck slider take on the same tiny proportions of everything else on the Linum cable. The slider has excellent grip and will not move on you, once you’ve set it at your desired location. A thickness and Y-split comparison between a stock cable, the Linum BaX, and a plusSound cable. Continuing the theme of diminutive parts is the jack used for termination. My 2PIN cable is terminated in a 2.5mm gold plated plug that is wired for balanced use on all new (balanced output) Astell & Kern devices. Judging from pictures and Estron’s own literature, the Linum 3.5 mm single-ended plugs should be even tinier and appear to be iPhone case friendly. The 2.5 mm connector of the Linum cable has some minor issues with intermittent contact when spinning the plug around in the jacks of Astell&Kern devices, but it’s believed by many that this issue is more of an issue for Astell&Kern than for connectors themselves. It’s worth noting that the Estron plug does experience some cutting out on my AK240 if I twist it while in use but if I just leave it alone, there are no issues. My stock UE balanced cable and plusSound balanced cable do not experience this. However, based on much of the conversation on Head-Fi, this occurrence seems to be more of an issue with the consistency of the 2.5mm receptacles iRiver has chosen and can be a common occurrence with a variety of different jacks. The length of the cable I have on hand is 48” from tip-of-plug to tip-of-connector, which seems about two inches shorter than the average cable. I wouldn’t mind seeing Estron add about 2” above the Y-split. All Linum cables are made from 6 Litz conductors, each consisting of 7 individual strands. Each strand is made from silver plated copper coated with enamel. The manufacturer claims these will not corrode or change color over time. Linum cables, regardless of connector type, come in three model choices: Vocal, Music or BaX. There are a two major differences between the models, with the most obvious being DC (resistive) impedance. For optimal technical performance with very sensitive multi-BA applications, the BaX model with lower impedance is recommended. Linum has posted some measurements of all three, using the same source gear and IEM, as performed by Cosmic Ears. Keep in mind that these measurements might not be applicable to all earphones. My hope is that Estron can someday release a future model with less than 1 Ω impedance, while still maintaining all the great features of current models. However, the BaX dual twist configuration seems to fight with the coiling action and actually tangles pretty easily, which is one of my few and largest frustrations of the BaX cable I have on hand. The video shows a non-dual twist configuration, so this tangle-free, self-coil action seems to only be applicable to the Vocal and Music models. I’m not typically one to say much about cable sound differences, as I find most differences often extremely subtle or even non-existent — however, at times, I have heard distinct differences and whether they are good or bad is often in the ear of the beholder. On the UERM, I did indeed immediately detect a difference — the treble seemed to be reigned in, making my perception of the UERM seem bassier, with less treble presence. I would only recommend this combination if one found the UERM a little too bright or wished for more bass. Perhaps this is a case where the 1.4 Ω impedance is coming into play with the UERM impedance dipping to near 12 Ω in the middle treble. While I really prefer the ergonomics of the BaX, I definitely prefer the sonic qualities of the stock cable. On the Nocturnal Audio hybrid, the findings are a bit different. This hybrid came with a 4-core silver and copper hybrid cable, a 4-core copper cable and an 8-core copper cable (all custom-made by Nocturnal Audio). All three of these custom cables have surprisingly good ergonomics compared to most custom cables I’ve used but still fall short compared to the virtual invisibility of the BaX. Sound wise, the Nocturnal hybrid is obviously brighter sounding than the two copper cables, both which sounded pretty much the same to me, and provided the best voicing for the IEM. The DC impedance of these cables and IEM are unknown to me. The Linum BaX sounded awfully similar to the hybrid cable — their differences were extremely small and difficult to detect. Considering the aesthetic and ergonomic benefits of the BaX, the choice here, for me, would be no-brainer. The Linum BaX cable with a new Nocturnal Audio IEM. The aesthetics and ergonomics of the Linum cable are undeniably great and if usability issues like flexibility, comfort and use with glasses are a priority, then the Linum line of cables should be at the top of your list. In real-world usage, the BaX makes me feel like I’m wearing IEMs without cables — seriously good. These usage factors make the Estron Linum BaX one of my favorite cables I’ve ever used.